“A child prodigy who performed at the White House for President McKinley, Elsie Janis burst to stardom on Broadway while still a teenager doing clever imitations of famous Americans. But it was her legacy as the first person to entertain troops on the front lines in war-ravaged France that bestowed immortality on her and gave her the nickname 'The Sweetheart of the A.E.F.'. Archeophone proudly presents the almost-complete acoustic-era output of the Columbus, Ohio-born firestarter who was a household name for more than three decades. It is brought to you in collaboration with our friend, the late scholar Allen G. Debus, whose lifetime passion for the recordings of stage personalities from days gone by is evident in the lavishly illustrated and generously annotated 24-page accompanying booklet. 'Sincerely Yours in Imitations' - so signed 'Little Elsie' in a 1905 autograph, as she tried to find her own unique voice. It wouldn't be long for the former Elsie Jane Bierbower. Star turns in The Hoyden and The Vanderbilt Cup led to marquee billing in The Slim Princess and Montgomery and Stone's THE LADY OF THE SLIPPER. It was this latter vehicle that occasioned Elsie's first visit to the recording studio in 1912, where she waxed her own compositions, 'That Fascinating Baseball Slide', 'When Antelo Plays the ‘Cello', and - her most famous - 'Fo’ de Lawd’s Sake Play a Waltz'. American shores couldn't keep her, however, and Elsie set sail for London. Scoring with 'Florrie Was a Flapper' and 'You're Here and I'm Here' (in duet with Basil Hallam), Elsie was an unqualified success in 1914's THE PASSING SHOW, with music written and conducted by Herman Finck - so much so that the principals reunited in THE PASSING SHOW of 1915. Here she paired again with Basil Hallam - now her fiancee - on 'I've Got Everything I Want but You', 'The Same Old Song', and the American 'Ballin' the Jack', with new lyrics for its English audience. Other hits included 'The Fortune Teller' (to the tune of Irving Berlin's 'He's a Rag Picker'), 'Prudence', and Janis' new composition, the stunningly modern-sounding 'I Want a Dancing Man'. Elsie's next trip to the London studios wouldn't be for another 18 months, in August 1916, but it would be under tragic circumstances. Only two days earlier, her beloved Basil Hallam, lately enlisted in the war effort, was killed when his observatory balloon crashed. She set about healing by recording several bits hits of the day, including the Jolson-popularized 'Yaaka Hula Hickey Dula', 'Along the Rocky Road to Dublin', and two Irving Berlin numbers, 'I’m Not Prepared' (about a wounded soldier who is 'not prepared' to fall in love with his nurse) and 'When You’re in Louisville (Call on Me)', a hit in the States for Anna Chandler. Janis returned again to the U.S. and starred briefly in MISS 1917, but she had another calling to answer. Interpolating war songs into her vaudeville routine proved very popular with American audiences and, after the U.S. entered the Great War, Elsie Janis got the idea of performing for the soldiers in action on the western front. No one had ever attempted such a thing before, and there was no money available to underwrite the cost. So, at her own expense and peril, Elsie traveled to Europe and began putting on shows for the American Expeditionary Force, sometimes performing on tabletops in front of headquarters. She was a huge success, boosting morale and endearing herself forever to American and British troops as 'The Sweetheart of the A.E.F.'. 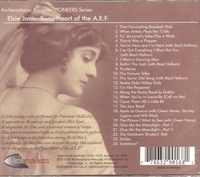 Only days after the armistice, Elsie repaired once more to the recording studio and waxed 'I Love Them All a Little Bit', 'The Jazz Band', 'Après la Guerre' - joined by fellow HULLO, AMERICA! cast members Owen Nares, Stanley Lupino, and Will West -'The Picture I Want to See' (with Owen Nares), and Parts 1 and 2 of 'Give Me the Moonlight', which features Elsie doing her dialect imitations and reading a poem dedicated to the British soldiers.